This Saturday, July 28th, I will be doing a book signing in Tulsa with Sarah Rees Brennan (THE DEMON'S LEXICON, TEAM HUMAN, UNSPOKEN) and Ally Carter (the Gallagher Girls series, HEIST SOCIETY). There is a plan afloat for Sarah to read from UNSPOKEN (out in September), for me to read from my upcoming assassin romance, NOBODY (out in January), and for Ally to read from PERFECT SCOUNDRELS (Heist Society #3, out in February). We will also be answering questions, and if you ask nicely, SRB might dispense valuable advice on how to keep badgers from breaking your legs. The final contest entries definitely lived up to the first four! 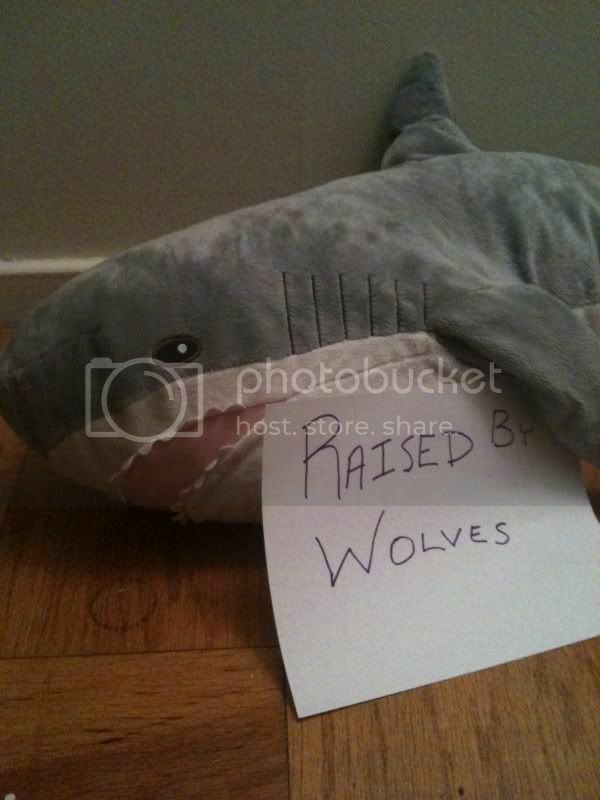 I am planning a collage of the pictures you guys sent in of the words “I was raised by wolves” written on your hands. I am still chuckling at “Chasing Cars with Werewolves” and “The Hills Are Alive With Werewolves” (not to mention “Love is a Battlefield with Werewolves), and it appears you all have a great assortment of knacks (and to the person who said they have a knack for eating Nutella with a spoon, I share that knack. It is one of my most finely honed skills). Thanks for participating all week. I hope the contests were as fun for you as they were for me! And without further ado, the winner of the last early TAKEN BY STORM copy is… Twitter user @AnahitMoumjian! Email golden_or_non at yahoo dot com with your address to claim your prize. And to everyone else… just ten days until release! We're down to eleven days until the release of TAKEN BY STORM... and to the last contest of the week! So far, these contests have brought a great deal of awesome into my life--like such classic book titles as "Harry Potter and the Werewolf's Stone" (via @writertessa and @pilesofbooks, among others) and "Snakes on a Werewolf" (via @The_Ceilidh). And that's not even touching the Werewolf Food Pyramid. Do any or all of the following. If there's one challenge you particularly like, you can just do that one AS MANY TIMES AS YOU WOULD LIKE. Or you can try to do all of them. Or you can mix and match. * Write the words "I was raised by wolves" on your hand and take a picture of it. Then upload the picture. * Add the words "with werewolves" to the end of one or more song titles. (Such as the Taylor Swift classics "Fifteen with Werewolves" and "Tim McGraw with Werewolves," both of which probably would have been very different songs if they had been so named). * Tell us which actors you would cast to play one (or more) of the Raised By Wolves characters. *What would you look like if you were a werewolf? Describe your wolf self or link to a picture of a wolf that fits your mental image of werewolf-you. *Draw a stick figure werewolf. (Or, if you would prefer, a stick figure adaptation of any scene in the first two books). Take a picture of your drawing (or upload it via whatever means you would prefer). *Take a video of yourself howling. *Finish the following: "I have a knack for [fill in your superpower here]." (For instance, I have a knack for sucking pens dry of ink the second I touch them). *Fill in the following: "If you like Raised By Wolves, you should read [insert book recommendation]"
*Fill in the following "Forget about werewolves. I'm all about the were-[fill in animal of your choice]." (For example: Forget about werewolves. I'm all about the were-flamingo). On tumblr, reblog this post and add your entries (if you want to do separate posts for your entries, just reblog it multiple times). On facebook or your blog (or wherever else you choose to play), link your entries to this contest and leave a comment on http://jenlyn_b.livejournal.com so that I can find them. WHAT: A chance to win the last remaining finished copy of TAKEN BY STORM that we are giving out in advance of its release. WHO: Anyone can play, but since the prizes are being provided by my US publisher, they can only be shipped to a US or Canadian address. (I know this is sad for international folks, but my hands are tied). HOW MANY: Unlimited entries. One winner, to be announced sometime Friday night after the contest has closed. Email me at golden_or_non at yahoo dot com to claim your prize. We’re down to the last two giveaway copies of TAKEN BY STORM. I am not sure anything can top your entries for the last three contests, but we are going to try. So, for example, you might have been raised by werewolves if you have to remind yourself not to sniff your dates. Or you might have been raised by werewolves if watching Bambi makes you hungry. On tumblr, reblog this post and add your entry. WHAT: A chance to win one of two remaining finished copies of TAKEN BY STORM that we are giving out in advance of its release. WHEN: From the moment this entry is posted and running until 11 PM Eastern Standard Time on Thursday, May 10th. HOW MANY: Unlimited entries. One winner, to be announced sometime Thursday night after the contest has closed. The most frequently haiku-ed character for contest #3 was Bryn. (Side note: haiku makes an excellent verb). After that, you all were pretty evenly split between Devon and Chase, with a handful for Callum and Lake, and a surprising number of deliciously creepy entries for the Rabid from book one. Email me at golden_or_non at yahoo dot com to claim your prize! Write a RAISED BY WOLVES themed haiku (5 syllables/7 syllables/5 syllables) about one or more of the RBW characters. (In case you hadn’t guessed, that would be a haiku about Shay. I feel like Devon might find it therapeutic to write haikus about Shay and his lack of morals and horrible sense of fashion). WHAT: A chance to win one of three remaining finished copies of TAKEN BY STORM that we are giving out in advance of its release. WHEN: From the moment this entry is posted and running until 11 PM Eastern Standard Time on Wednesday, May 9th. HOW MANY: Unlimited entries. One winner, to be announced sometime Tuesday night after the contest has closed. First off, I have to say that there is no cure for the rainy day blues like pictures of puppies, kitties, and much-loved stuffed animals. The cuteness! I will see about putting together a video of all of the entries, because I want to immortalize them FOREVER. And also maybe use them to decorate my walls. Anyway, I had the idea that I might be able to “judge” these entries and pick a favorite, but it was too hard! So I turned to the random number generator, and it randomly generated one of my very favorite entries! Congratulations to KELLY METZ, Twitter user: bwlrgrl300! Email me at golden_or_non at yahoo dot com with your address to claim your prize! 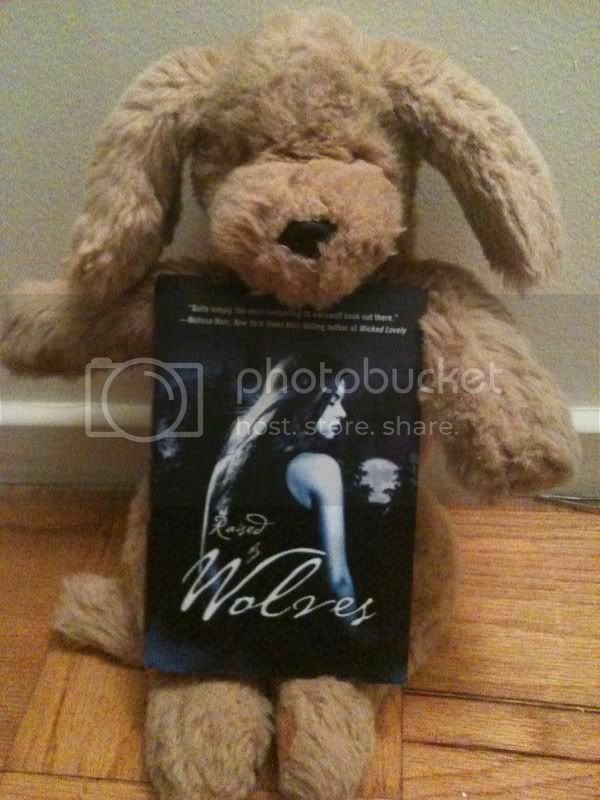 Take a photo of your dog, cat, household pet, or stuffed animal next to a copy of RAISED BY WOLVES. 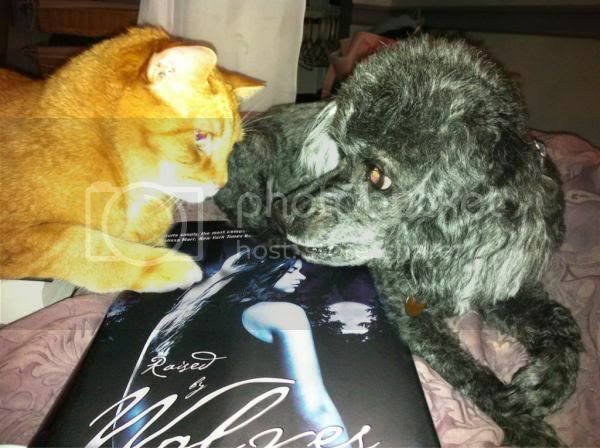 If you do not have a copy of the book, write the words “Raised By Wolves” on a sheet of paper (in whatever decorative fashion/color/etc that you like) and take a picture of dog/cat/pet/stuffed animal with that. WHAT: A chance to win one of four remaining finished copies of TAKEN BY STORM that we are giving out in advance of its release. WHEN: From the moment this entry is posted and running until 11 PM Eastern Standard Time on Tuesday, May 8th. HOW MANY: One entry per dog/cat/household pet/stuffed animal, but no limit to the number of times an individual may enter DIFFERENT dogs/cats/household pets/stuffed animals. One winner, to be announced sometime Tuesday night after the contest has closed. Rose, email golden_or_non at yahoo dot com to claim your prize! Everyone else, stay tuned for the next contest, which will go up tonight before I go to bed.